Thank you for your interest in our Folios™ Cheese Wraps. Q: Why are Folios hard to find or out of stock? Since the start of the year, the Folios line has become a hit on Instagram, Twitter and Facebook with hundreds of thousands of impressions, with interest growing every day. Additionally, the line has been featured in over a dozen publications including People Magazine, Food & Wine, POP Sugar Fitness and Women’s Health. We are experiencing a temporary delay in product shipments. Q: I can’t find Folios near me . . . can I order them online? Unfortunately we cannot fulfill online orders. However, Folios are now available on Amazon Fresh. The locations being served are Atlanta, GA; Seattle, Washington; Boston, MA; Washington, DC; Dallas – Ft. Worth, TX; Denver, CO; NYC; Los Aneles, CA; Miami, FL; San Jose, CA; Orange County, CA; Chicago, IL; and San Francisco, CA. Supplies are currently limited, however. 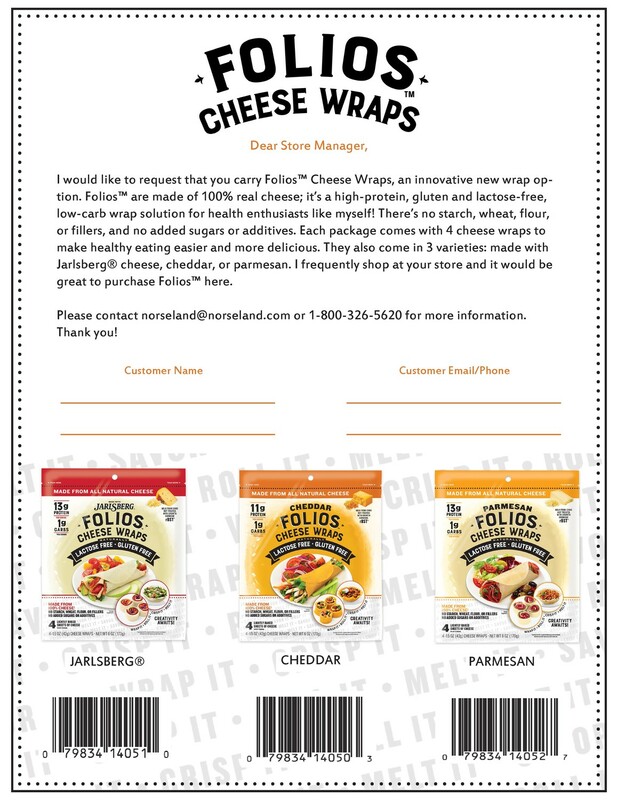 We apologize if you live in an area not served by Amazon Fresh yet and we hope to have Folios™ Cheese Wraps available to you soon. If you'd like your local grocery store to carry Folios™, you can help! Simply print out this form and give it to a store manager or customer service representative, and we can work together to bring Folios™ to a store near you! Q: Are Folios available outside of the United States? We currently only distribute to stores in the United States. Q: How are Folio’s lactose-free? Folios are naturally lactose free. The wraps are made with aged cheese; during the cheese making process, enzymes naturally convert the lactose to lactic acid over time. Typically, people with lactose sensitivity can still eat aged cheese, like Parmesan, Swiss, and aged Cheddar. Q: Are Folios truly low-carb? Folios Parmesan and Jarlsberg contain only 1g of carbs per serving, and Folios Cheddar contains 2g carbs per serving (1 serving = 1 wrap). Cheese is a naturally low-carb, high-protein food. For our full nutritional panels, please visit the product page for Cheddar, Parmesan, and Jarlsberg. Q: Are Folios full of preservatives and extra junk? Absolutely not! Folios contain no wheat, starch, filler, or added sugars. Our ingredients are pasteurized milk, salt, and microbial enzymes (enzymes are part of the cheese-making process). For our ingredient lists, please visit the product page for Cheddar, Parmesan, and Jarlsberg. Q: Do Folios contain animal products? Folios contain milk. However, we do not use animal enzymes in the cheesemaking process. Q: How are Folios different than regular cheese? Folios taste exactly like the cheeses you love, in a thin wrap-ready form! Folios make it easy to enjoy low-carb wraps or create crispy, cheesy appetizers while keeping track of portions and carbs per serving. Q: Can I freeze Folios? We do not recommend freezing Folios, as this can change the texture and form of the product. Q: How can I crisp up Folios? You can crisp Folios in a microwave: place parchment side down for 1-1.5 minutes. If not crispy, cook for up to an additional 30 seconds. Microwave ovens vary and cooking time may need to be adjusted to your desired crispiness. In a conventional oven, place Folios with its parchment onto a baking sheet and bake at 375F for about 6 minutes, or until browned. Once Folios are crispy, you can enjoy as chips, taco shells, or serve with entertaining appetizers. Q: Can I melt Folios? Of course! Heat Folios as a portion-controlled cheesy layer over soups, as part of a quesadilla or omelet, or any dish you’d like to add cheese to.